The Duchess of Cambridge attended her first red carpet event since becoming a mother this evening. 31-year-old Kate beamed as she accompanied husband William to the Tusk foundation gala dinner at The Royal Society in London. She wore a glittering floor-length Jenny Packham dress covered in sequins with her brunette hair carefully curled over her shoulders and simple, pretty make-up. Kate finished the look with sparkling stiletto heels and diamond jewellery. William, who wore smart black tie, is a patron of the Tusk charity, and expected to make a speech at the end of the awards ceremony which will be hosted by journalist Kate Silverton. Tonight's awards aim to celebrate outstanding achievement in the field of African conservation, recognising the achievements of individuals who are ensuring the future of Africa and bringing the challenges faced by the continent to a global audience. Just last month, Kate made her first public appearance since the birth of Prince George when she attended the Anglesey ultra-marathon with William. Back in her skinny jeans just five weeks after having her son on July 22, Kate looked sensational - without the slightest sign of baby fatigue - in a green tweed hacking jacket, Zara top and J Brand jeans. 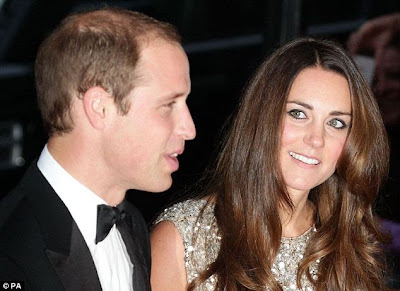 Then, Prince William had revealed that Kate was bearing the brunt of the night duties - and that their son was proving to be quite a nocturnal little fellow. Despite that, the Duchess appeared remarkably bright-eyed as she chatted with well-wishers from the island, thanking them for their hospitality and the kindness and warmth they had shown the couple during their time on Anglesey. The Duchess revealed that her mother, Carole, - or granny as she called her - had come up to babysit, and told locals that he was 'sleeping well'. 'But I know these things suddenly change,' she added. She mentioned during the visit she was keen to get 'back into shape' after the birth. Tonight's outing marks the start of a new role for William as he begins a new life outside the military. Kensington Palace today announced that Prince William has completed his final duties as a search and rescue helicopter pilot with the RAF. The Duke of Cambridge is now looking to expand his charity work, particularly in the field of conservation and endangered species, making tonight's event all the more significant. William, who carried out his last operational shift on Tuesday, is to continue to carry out royal engagements but is not expected to increase his number of public duties. Sources have said the prince is in a 'transitional' year and is considering options for his 'public service'. The two are making final arrangements for their move into Kensington Palace, which will become their London base after leaving Anglesey. The couple, who went to live with Kate's parents, Michael and Carole Middleton, at their £4.8 million mansion in Bucklebury, Berkshire after the birth of Prince George, are to say goodbye to the island that has been William's home for three years, or two for Kate.